As good as the opening two days of Glorious Goodwood were, there was something - or someone - missing. The sight of Frankie Dettori in a stylish suit but with a microphone in hand as he roamed around for ITV was gret for for the broadcaster but not for race-goers, denied the chance to see him in his silks because of the final couple of days of a ban for careless riding. On Ladies' Day he was back in the saddle but without success - on Friday, he was back in more familiar territory - the Goodwood winner's enclosure, not once but twice. His two wins took him to 199 Goodwood winners - the next one will be quite something, an occasion few will want to miss. Dettori recorded a 142/1 double on day four of the Qatar Goodwood Festival, completing it with 12/1 shot Desert Path's comfortable success in the concluding race, the 11-furlong Maltsmiths Handicap. Trained locally by Amanda Perrett near Pulborough,, the three-year-old son of Champs Elysees kept on well to score by a length and three-quarters. Dettori said: "It was very straightforward. They went very fast and it suited Desert Path. He won well." Earlier, ever the showman, Dettori treated racegoers to his trademark flying dismount following the 10/1 shot Regal Reality's impressive length and three-quarter victory in the £100,000 G3 Bonhams Thoroughbred Stakes for trainer Sir Michael Stoute, who was registering a day-four double following Mirage Dancer's (6/5) success in the G3 Bombay Sapphire Glorious Stakes. Ostilio (4/1) and Chief Ironside (20/1) set a fierce gallop in the mile contest, but Italian crowd favourite Dettori produced an ice-cool ride, pouncing on his rivals at the furlong pole to score comfortably. Dettori was impressed with the colt's performance in today's £100,000 event. He said: I thought I might have overdone it, but Regal Reality has some serious gears. It took him about four or five strides to really get down and race, and then he took off. The gallop they went in front, I thought they can't keep that up. The main thing is to get him to settle and he settled well. "I didn't want to go after the pace and I followed James Doyle on Threading early on. Two and a half-furlongs out, I knew I had to start making my move as he wasn't taking me further. I was told he had a good turn of foot and I thought for the first five strides, he didn't pick it up like I thought he would. However, when the turbo kicked in, I thought I was going to get there easily and I won easily in the end. "He is definitely smart and Sir Michael was very keen on him when I spoke to him. Regal Reality put some nice horses to bed today and he has a bright future. I'm not sure where he will go next but he has many options. I'll leave that to Sir Michael and the Cheveley Park team." It was Sir Michael Stoute's 80th Glorious Goodwood winner - and came 35 minutes after his 79th as the victory of Mirage Dancer in the Glorious Stakes (G3) was a sixth race victory for the trainer and a third in succession following on from Kings Fete in 2016 and Poet's Word in 2017. This year Poet's Word is a dual Group 1 winner of the Prince Of Wales's Stakes and the King George VI & Queen Elizabeth Stakes. Stoute was not at Goodwood but Lord Grimthorpe, racing manager for owner Prince Khalid Abdullah, said: "It was a very pleasant race to watch, the good thing is Mirage Dancer settled really well. We had a good idea that he'd be at home here as he won at Goodwood earlier this year, but the race today went very smoothly. "I think Ryan wanted to kick on earlier than he would have liked to as they were going a tad too slow for him, but the way he did it was nice and Mirage Dancer went on and ran well to the line. I think he is at last coming to the horse that we have hoped that he would make into." The Queen enjoyed her second winner in successive years at the Qatar Goodwood Festival - Fabricate, trained by Michael Bell, won the opening race in 2017 (finished second but was awarded the Matchbook Betting Exchange Handicap in the stewards' room), while today Seniority won the Unibet Golden Mile, trained by William Haggas. Haggas said: "That was good. It was a rough race, but as with a lot of the races here, if you are travelling, you have half a chance. And this horse was always travelling really well - when the gaps come here you have to take your opportunity - if you are hesitant and take a bit time, then you invariably don't. He showed a smart turn of foot and, in the end, won not exactly cosily, but by a not bad half length." The same trainer completed a 21/1 double with the narrow success of 3/1 favourite Pretty Baby in the G3 £80,000 L'Ormarins Queens Plate Oak Tree Stakes. Ridden by Dane O'Neill, the three-year-old daughter of Orpen displayed a smart turn of foot in the closing stages to hold off the challenge of the fast-finishing 7/1 shot Dancing Star by a neck. Going into Saturday's racing, Haggas is the leading trainer at this year's festival with four victories. Move Swiftly (Matchbook Time To Move Over Fillies' Handicap) and Alfarris (Matchbook Betting Exchange Handicap) have also tasted success so far this week. It was also Haggas' 50th winner at Goodwood. He said: "Dane O'Neill said the saddle went forward at the top of the bend. He rode a beautiful race on Pretty Baby, but it was not as smooth as he would have liked. 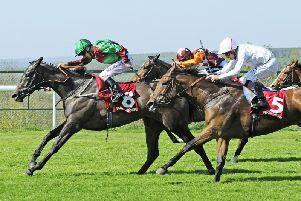 It was her first time at seven furlongs and we always thought she might appreciate the step up in trip, so it was good." Don Armado (11/1), trained by Newmarket-based Stuart Williams, who was enjoying his first Qatar Goodwood Festival victory, has now run six times in his young career, winning last time at Nottingham and backing that up here in the six-furlong Unibet Nursery. Winning jockey Harry Bentley said: "He's a progressive colt. I thought he did everything right when he won last time at Nottingham - then he was a bit green throughout the early strides, but the penny really dropped in the final furlong there."